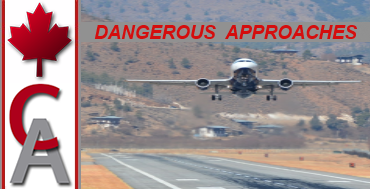 Description: Join us for our first in a series of "Dangerous Approaches", as we fly the runway 15 approach into Paro airport, one of the World's most dangerous approaches. Paro airport in the kingdom of Bhutan in the Himalayas is classed by 'Boeing' as having one of the most dangerous and difficult approaches in the world. So treacherous is the landing that only eight pilots in the world are qualified to land here. Runway 15 approach requires a 5000' descent within a few miles and a 360 degree turn within a narrow valley that has 12500' - 18000' mountain peaks all around... then the pilot has to perform a difficult and dangerous 'S' turn on short finals to land... sometimes finally leveling the wings while crossing the threshold of the runway. Description: Join us for Dangerous approaches 2, our second in a series of "Dangerous Approaches". We will depart CYVR and make our way north to Fort Good Hope Airport. 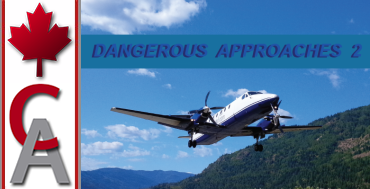 Testing your flying skills on some of the most beautiful, but dangerous and challenging approaches British Columbia's has to offer! Description: Join us for Dangerous approaches 3, our third in a series of "Dangerous Approaches". We will depart from Fort Good Hope and make our way south to Vancouver. 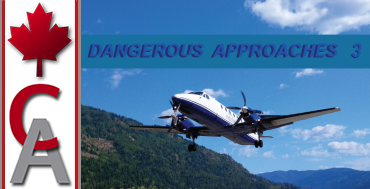 Again testing your flying skills on some of the most beautiful, but dangerous and challenging approaches British Columbia's has to offer!